As many of us will already have expected, the 9800GX2 is without doubt the fastest card of the bunch. Managing to beat out the 3870x2 by up to 70fps in some benchmarks, the 3870x2 is certainly starting to show its age. However, the reason we came here today was not just to simply pit these three dual-gpu cards against one another, but to find out if the higher price tag of the 9800GX2 is actually worth it. With £35 separating the 3850x2 and 3870x2, and a further £100 between the 3870x2 and the 9800GX2, there are certainly some savings to be had if the performance differences between the cards is something that you'll never actually see. Looking back at the graphs over the previous pages, all three cards are more than adequate at playing most games at high resolutions and with AA enabled. However, when you get to the more taxing games such as Crysis the ATI cards struggle to make 30fps, whereas the 9800GX2 comfortably manages at least 50fps. With all things considered, the results are actually quite a bit closer than we was expecting. 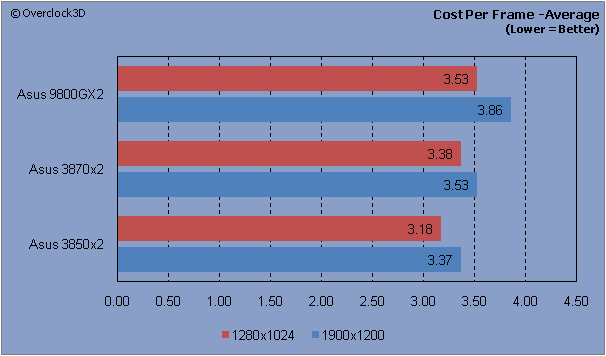 Yes the 9800GX2 is over £100 more than it's nearest ATI counterpart, but the extra performance of the card brings its overall cost per frame to £3.86 at 1280x1024 resolutions and £3.53 at 1900x1200 resolutions. The 3850x2 does offer the best value for money across the board with £3.37 and £3.18 prices for 1280x1024 and 1900x1200 resolutions respectably, but with only a measly £0.49 between the highest and lowest results, it's hard not to recommend the 9800GX2 if you've got the cash.